Tonight (Wednesday), Terra, Wesley, and I played PSO together. I’m trying to make this a weekly family night thing. He is 8, I know he can figure this out. The basics anyway. We got another 16 photos printed, framed, and hung. A few added to the collection by Wesley’s room, but most of them start the new project on the wall by the dinner table. Both look great. I should have taken a pic to post. Tuesday, we went again to the home fellowship we tried last week. It has a good sized crowd, it’s close, it’s early enough in the evening to work with our early bedtime, they have hang out time after study. So, it’s all sorts of stuff we need a home fellowship to be. We finished season two of the Hitchhiker’s Guide to the Galaxy. We’ll get to season three eventually but now we’ve started season two of Second Shift – probably my favorite “podio theater” we know. We never got around to the final two episodes so this is good. My new cookbook finally arrived on Monday and I’m very excited. On the same day, we were in Sam’s Club (Noel got us a membership!) and Terra came across a cookbook she bought me – maybe because she was tired of hearing me complain that the one I ordered hadn’t shown up yet. So, I ended up with two cookbooks on one day. 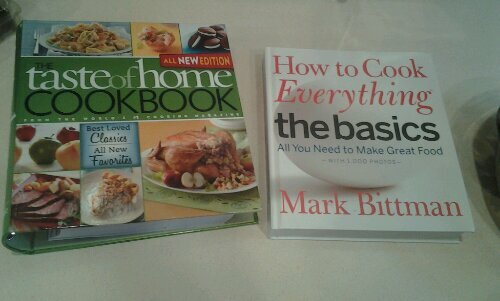 These are the first cookbooks I’ve ever owned. I don’t think I’m doing “bachelor cooking” anymore but I still know so little. I still want to trade with someone – you teach me all you know about cooking and I’ll teach you everything I know about coffee. Anyway, I asked on /r/cooking what a good first cookbook would be and I sifted through the many suggestions, did some research, and went with How to Cook Everything – The Basics. Now, I just need time to sit down with them! Back on routine, good week. 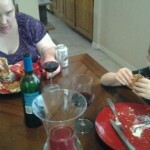 This entry was posted in daily recap and tagged audio theater, cooking, gaming, home fellowship, house husband, ingress by ABQChristopher.Bookmark the permalink.